Three foreign human rights and environmental campaigners have come together to reject the application by Banks Group to mine at Highthorn, Northumberland. The local campaign, Save Druridge, have been doing brilliant work in raising fighting this application. Activists from Colombia, Russia and Indonesia, who are all battling against coal mines in their own countries, have objected to the application. Coal mines from these three countries either supply the UK’s power stations, are operated by mining companies listed on the London Stock Exchange, or both. All three campaigners have visited the area. 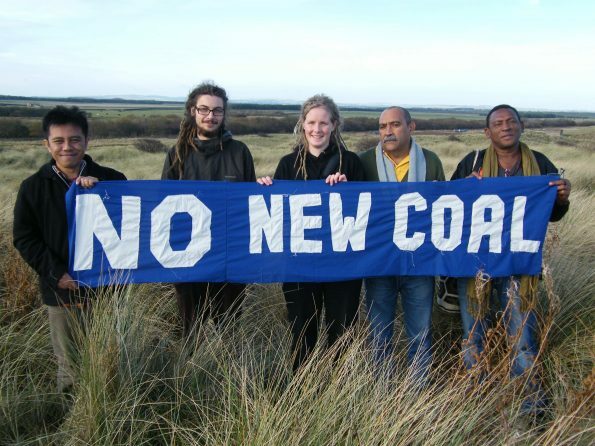 “Banks Mining cannot open another opencast coal mine in Northumberland because it would destroy the balance of life, the plants and the animals, as well as contaminate the water and the environment for many kilometres around. In my country, Colombia, BHP Billiton and Anglo American coal mines have destroyed and continue to destroy communities and families, some of whom have lived on this land for 300 years. Please say no to more murderous mining,” said Francisco Tovar. Francisco is a dentist who was displaced by the Cerrejón coal mine’s expansion. He visited Highthorn in Autumn 2014. Across the world, communities and governments are moving away from destructive fossil fuels, which cause localised damage and contribute significantly to global warming. The UK needs to play a proactive role in this move away from coal. Mining companies such as Banks sometimes claim that burning coal from the UK reduces the reliance on burning imported coal. In reality the picture is much more complex. These campaigners see that all mining is linked and that it is vital that coal mining is opposed in the UK and abroad. “As a campaigner against coal mining in Russia I must object to the application by Banks to mine at Highthorn. In Russia there are gross human rights abuses and environmental destruction caused by coal extraction. The UK is the second biggest consumer of Russian coal. Burning coal mined in the UK keeps power stations open for longer and so increases the demand for cheap Russian coal, which is blended with Britain’s coal to keep the costs down – but the damages are high. Coal mining is always a dirty business and it is time the whole world moved away from this damaging form of energy production,” said Vladimir Slivyak, Co-director of Ecodefense, a Russian environmental organisation. The Coal Action Network is requesting that local people join with the local Save Druridge campaign by objecting to the mining application. The application is expected to be heard on the 5th July at Northumberland County Council offices in Morpeth.